P1080564, originally uploaded by Aaron78. 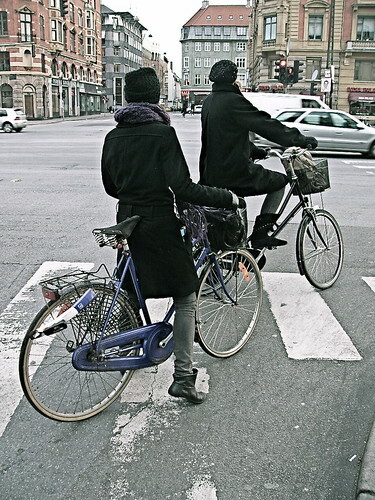 Two warmly clad Copenhageners on their way to work this morning. It's seriously cold at the moment, but I have to forego gloves to bring you shots like this. The sacrifices we make here at Copenhagen Cycle Chic! I love your blog! Probably it really is the best way to "inspire people in other countries to commute by bicycle or lobby for better bike conditions in their cities", as you described it. Great idea, keep it going! Thanks, gwadzilla! for the kind words and the link. a book is definately a good idea. thanks, roland! we're pleased you like the blog and have understood the message!